Late in the English Civil War a man by the name of Whitehead (Reece Shearsmith) finds himself saddled with the task of locating and arresting O'Niel (Michael Smiley), who stole some books from Whitehead's master, a prominent astrologer. Whitehead comes upon three deserters. Starving, they cook up some mushrooms and soon find themselves stranded in a strange field and under the spell of O’Neil who insists they find a hidden treasure before he turns them all into frogs. It is at that point things start to get weird. A Field in England is a highly stylized mix of surreal horror and deadpan humor. The entire film is shot in a high contrast black and white, with a minimal cast and just a few outdoor locations. There are long stretches of walking and talking broken up by strange musical interludes. Scenes are often introduced or concluded with the actors posing in tableau, and occasionally breaking the fourth wall by looking directly into the camera. It's not just high weirdness on display, A Field in England also likes to splash a little gore around especially during its prolonged climax. It is definitely a film that benefits from repeated viewings. The concepts and elements contained within are never spelled out. There's no quick tutorial of what time period it is, how alchemy, astrology, or a faerie circle should work. The characters are either unable or unwilling to explain anything to their cohorts. The movie holds its audience at a distance, but thanks to some very deft writing and characterization it still pulls the viewer into its narrative. There is wealth of dry wit and even a bit of scatological humor to keep the story from becoming a grim slog. The dialogue is very quotable, mostly from the seemingly simple, Friend (Richard Glover): “I think I have worked out what God is punishing us for. Everything.” All of the characters reveal hidden depths, and often in surprising ways. As a viewer I was surprised at how attached I had become to these world weary, cynical, and often cowardly people. Good characterization is often in sacrificed for spectacle in horror films, so it's absolutely refreshing to see it brought front and center without diluting the unsettling nature of the story. The soundtrack is a mix of period drumming that melds into eerie synthesizer music when things really start to go haywire. Friend even sings a short musical interlude, backed by an unseen female voice (listed as The Field in the credits). It's another marvelous tool to keep the viewer off center. 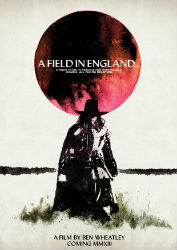 A Field in England's combination of stylization and obtuse story isn't for everyone, but if you're willing to put in a little effort and accept its peculiar design, you will find a tremendously enjoyable movie.It's also a much more fun experience than you would expect from a black and white horror movie set in the 17th century. I'll put this one on the list. Sounds like it has vibes of Beyond the Black Rainbow in terms of weirdness. ...also, have fun at Demicon. I'm not con'ing this year until BritishFest, more than likely.